While perusing questions over on Stack Overflow I came across a question concerning jQuery Mobile and multi-step forms. I thought I’d take a stab and building one. This is - of course - just one way to do it. At the end of the blog entry I’ll discuss some alternatives to consider, and as always, I’d love to hear from my readers about how they would do it. One quick note. For my solution I'll be making use of ColdFusion. The technique though is what it is important. What I do here with my server side language could also be done in PHP, Ruby, etc. Let's begin with my application's home page. 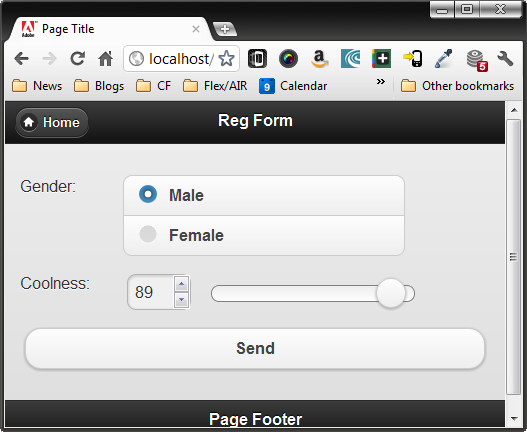 I made the assumption that the form would not be the first thing users see. So I created a simple page with a menu of links. The real meat of the logic is going to take place in someform.cfm. I decided to take the approach of a self-posting form. As you complete each step of the form, I'll take in your input, store it (in my case I'm using ColdFusion session variables, but this could be any persistence system), and increment a "step" variable that notes where you in the process. My registration form will have four steps. 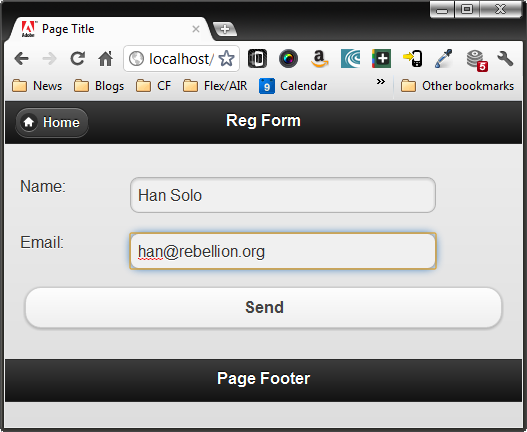 The first three involve actual form fields while the fourth is the final page. (This is normally where you would also store the data in the database, email it, or do whatever.) Here's the core file. Starting at the top, I begin by initializing my session variable to store the form data. I'm creating a structure to keep all the values. I also default the step to 1. Skip over the validation logic a bit and go down to the main page. You can see I make use of a simple switch statement. Now - my forms are not that big. I could included the code within each of my case blocks, but I wanted to make the file a bit easier to read. If you go back to the top then, you can see where I handle the form submissions. Right now I'm not doing validation, but that would be trivial to add. The basic concept is - store the values, increment the step. Carrying on - here is step 2. 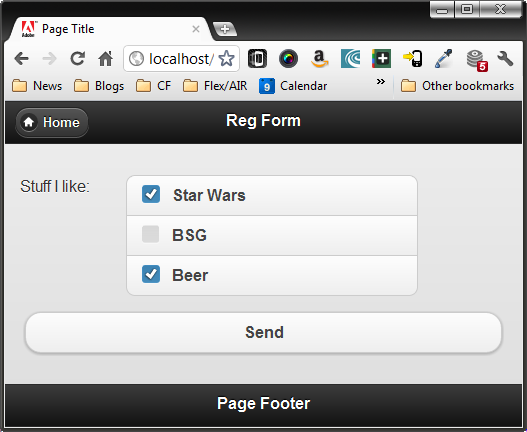 It's just more form fields and since it's pretty arbitrary, I won't bother explaining why I picked them. And finally, here is step 4. Note that back in the original file, after we include this we clear out the session data. That way in case they come to the form again it should start from scratch. And that's it. I've attached the code below. 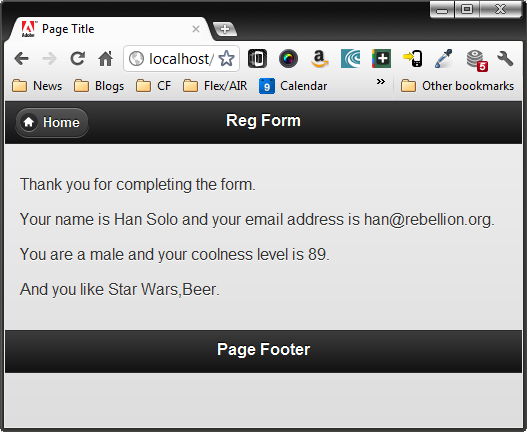 You can demo the code here: http://coldfusionjedi.com/demos/2011/nov/18/. So I mentioned alternatives - what are some? One possibility would be to make use of 'accordion' controls. I've seen that before on multi-step forms, but not on mobile. You can see an example of the control here.